When you are open to new adventures, one thing leads to another and there’s a lot to experience. That’s what happened to us lately. For some mystery reason until today not quite solved, we lost both the drivers of our beloved Pnoe horns due to DC. That the cause really was DC was proven by the log files of our prototype Hypex Ncore 1200 monoblocs which their designer Bruno Putzeys had cleverly built in. In a separate article we will dive deeper into probable causes and the elaborate remedies we have taken to prevent any reoccurrence of DC. The drivers in the Pnoe horns are AER MD 3B. Those are known for their ability to handle huge voltages over the full frequency spectrum but like any driver aren’t keen on DC. The amount of DC our incident presented was too much for their voice coils. The only option was to have the drivers repaired or replaced. So we contacted AER’s Filip Keller. After several mails and long telephone conversations we agreed to send our poor limp drivers to Stuttgart for repair. Next to replacing damaged parts, Filip would also upgrade the drivers to the next level, a currently still unnamed status which included fine tuning the individual drivers to perfection. During our various contacts Filip mentioned that he was auditioning a very special loudspeaker, a single driver three-way horn made by one of his clients based on his AER MD B driver. 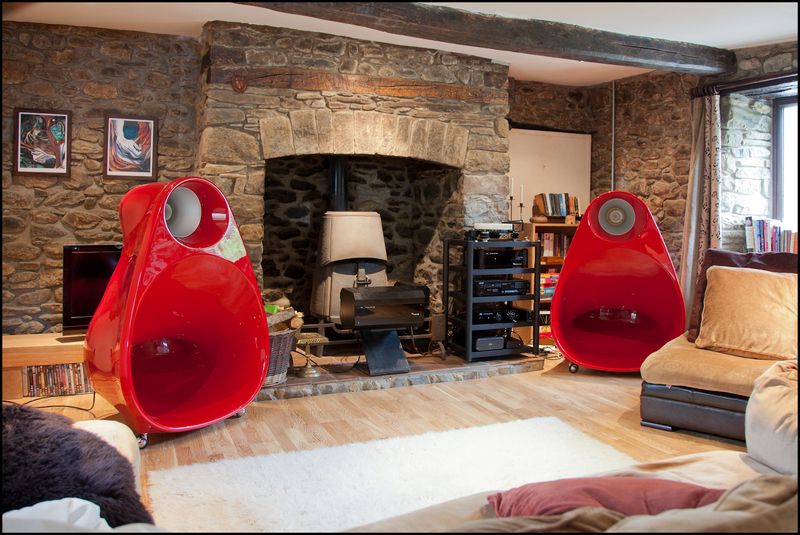 We could if we liked contact the speaker’s designer in the UK and perhaps audition the speakers ourselves. Filip was really enthusiastic about the ideas behind that British speaker and when we received our now better than new drivers back from Germany, we were keen on experiencing the AX Horn Loudspeakers’ Axjet. The man behind them is Frederic Davies, a man with quite some musical miles on his life’s odometer. Born in South Africa, raised partially in the US and formed in the UK, Fred is one of those lucky people who not only witnessed the upcoming of modern music, festivals, hippiedom and DJing but was and remains part of it. From playing in several bands he switched to the PA side of live music and whilst doing that discovered the fun of playing records to an audience first in mono and after his discovery of stereo at a friend’s place in two channels. Britain in the late ‘60s and early ‘70s was full of festivals frequented by renowned bands. Fred and a group of friends roamed the country not only to enjoy the performances but to actively play recorded music using his PA system in off-stage side venues. By around 1971 Fred was infected by the hornspeaker virus which hasn’t left him since. That year was also the first year the Glastonbury festival was organized. Fred joined the initiators and helped set things up. Initially the plan was to use a hornspeaker system for the main stage but the venue proved too big for the system on hand. Its designer Tony Andrews went on and now runs the world-renowned Funktion One horn-based PA system company. Fred himself went on and studied just about anything about hornspeaker design and manufacturing. He even dug out the floor of his house to accommodate folded bass horns that would end in two 1.5 square meter sized mouths. These horns were christened Axhorns for a name that lives on. Under that name Fred designed and installed build-in speakers and started the development of the Axjet in the mid ‘90s. These speakers were used not only in homes but also at festivals in side venue tents. With his strong connection to the Glastonbury festival, Fred was asked if he could help with very efficient loudspeakers for a sound system that was to be fully powered by muscle power, the pedal-powered PA. 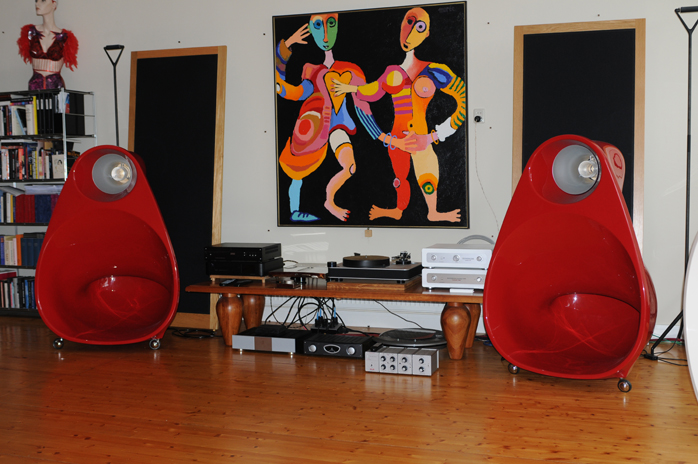 Throughout the 90’s Fred and his Axjet loudspeakers were responsible for chill-out venues at many festivals and parties. More recently those festivals where the Axjet speakers roam got bigger and bigger and Fred’s son and daughter are now involved in running the various events as well. With so much real live contact with the music-loving young generation, Fred senses that today’s youth has drifted away from hifi into the abyss of MP3, compression and PA systems based on wide dispersion line arrays. He wants to counter that and developed what he called an afterburner for his new Axjet version. That is based on Fillip Keller’s AER drivers. These drivers are not only highly efficient but can be played at high levels for extended periods without being damaged. The Axjet is not a hornspeaker as we know them. Basically there are two types. One back-loads the driver with a horn like our Arcadian Audio Pnoe, the other front-loads it like Avantgarde, BD, Cessaro and Acapella do it. Aside from those two kinds, the shape of the horn’s tract can be a choice of spherical like most front-loaded horns; tractrix like Klipsch; or hyperbolic, conical, parabolic and exponential. All have their strong and weak points. For his Axjet Fred came down on a combined hyperbolic/exponential version. With its single driver, phase alignment of the rear wave amplified by the back horn should prevent interference with the front wave enhanced by the already mentioned afterburner. 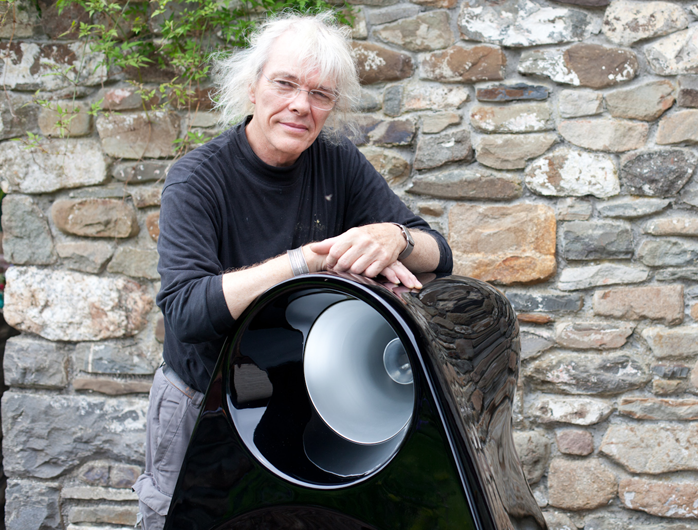 Fred Davies designed an exponential front horn from spun aluminium for the driver’s midrange frequencies. The AER driver’s whizzer cone is enhanced by a long clear polycarbonate center ring that acts as a tweeter horn. That is the afterburner kept in place inside the aluminium horn by three stainless steel rods. This construction makes it possible that the afterburner sits in front of the whizzer cone without touching it. 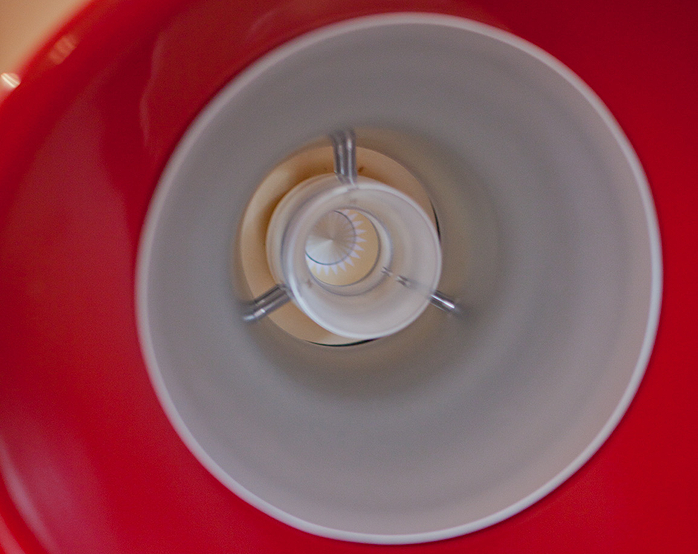 An additional small phase plug completes the afterburner design. The back horn as the other exponential horn is a circular snake ending in a mouth occupying the majority of the 93cm width and 2/3rd of the cabinets’ height. Said cabinet is a combination of glass-reinforced concrete, glass-reinforced plastic and polyurethane foams while the gloss polished finish is a ceramic lacquer. In line with its all-purpose indoors/outdoors use and thus humid climates as well, all fixtures are polished stainless steel or brass. The Axjet sits on three castors with rubber wheels making moving around of its 60kg easy. Total height on castors is 132cm while depth is a very door-friendly 71cm. Next to that door-friendly dimension, the Axjet is equipped with built-in handles in the form of convenient ridges to make lifting and carrying secure and easy. Fred claims a sensitivity of 95dB, a working bandwidth of 50Hz to 20kHz and a friendly input impedance of 16Ω. This single driver three-way horn speaker design and its use of an AER driver was more than enough to trigger our curiosity and make an appointment with Fred for an audition. After the necessary e-mail exchanges Fred delivered the Axjet to our place as part of a trip he and his son-in-law were making from his home in Wales to Filip Keller in Stuttgart. On the way back they stopped at our place before heading off to the ferry that would take them back to the UK. Thus on a Wednesday a van with a British license plate stopped at our place and Fred and his son in law emerged. 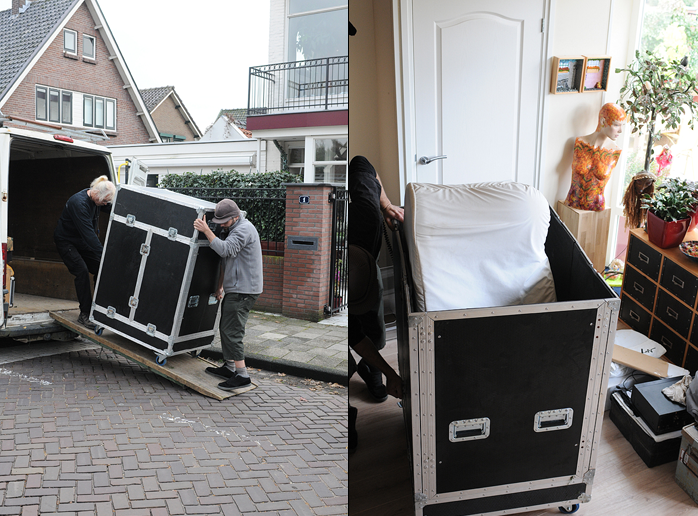 With the help of a ramp they unloaded two large flight cases each containing a loudspeaker. The flight cases of 78cm width, 1m depth and 1.5m height snuggly fit through our front door so unpacking could be done inside. The well thought-out cases could be taken apart and folded onto their own base for easy storage. For extra protection the speakers were clad in a water-resistant padded cover that can be used to have the speakers stay outside overnight after a party. 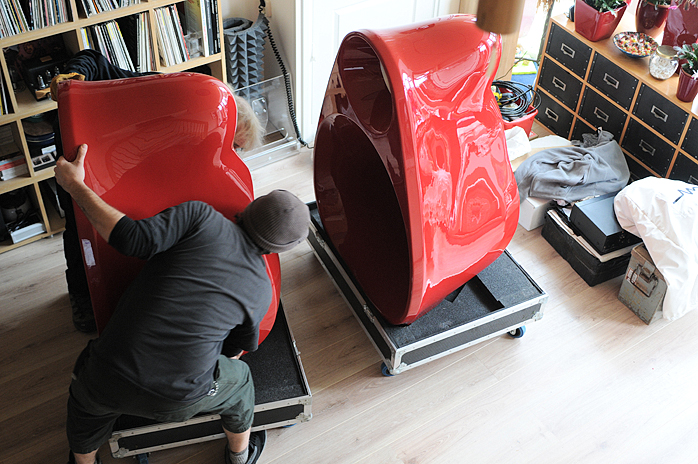 When the covers were taken off, a pair of bright red Axjet emerged in our downstairs hall. Our listening room is upstairs so the 60kg speakers needed to get up the stairs. On the bottom the castors provide enough grip to lift the weight and the ridge higher up on he speaker enabled easy pulling. In no time the two speakers had made it to the listening room. 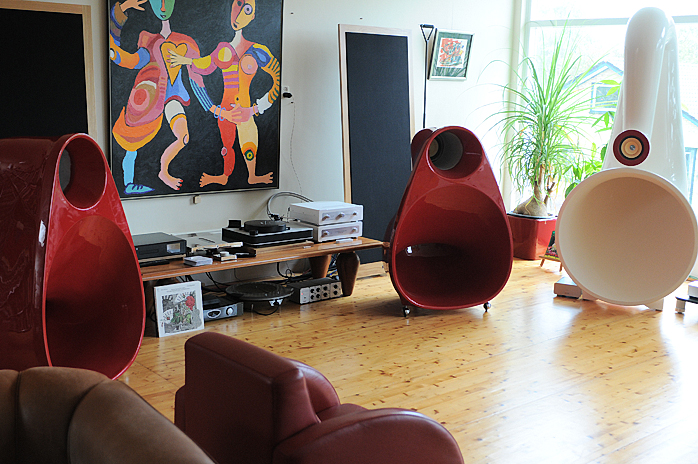 What a luxury to have no less than three pair of hornspeakers in one room. On top of that the red Brits completed the white Pnoe horns and blue Avantgarde Duo Omega horns into the colors of the Dutch flag and the Union Jack, US, French, Paraguayan, Croatian and a dozen other flags as well … but, hey. With the smooth castors, the Axjet rolled into position easily. From the van Fred brought some additional boxes. One contained a Deqx HDP4 and the other a NuForce DDA-100 power DAC. Between some odd bits and pieces was also a Behringer measurement microphone with stand and cables. A lot of hornspeaker cause mixed emotions on looks. There is little room between likes and dislikes. One might admire the more industrial looks of the older Avantgardes with their scaffold frames, others fancy the more salonfähig looks of their later designs. Our Pnoe horns with their >2m height are true smile jerkers but after that smile tends to come the ‘not in my place’ qualifier. We absolutely liked the shape and size of the Axjet and those who saw them all admitted to their friendly attractiveness. In our view and having spent time with the speakers playing and just sitting in the room, their shape has something magical to it - almost fairy like. Especially in the bright red colour and seen from the side, it hints at Little Red Riding Hood. 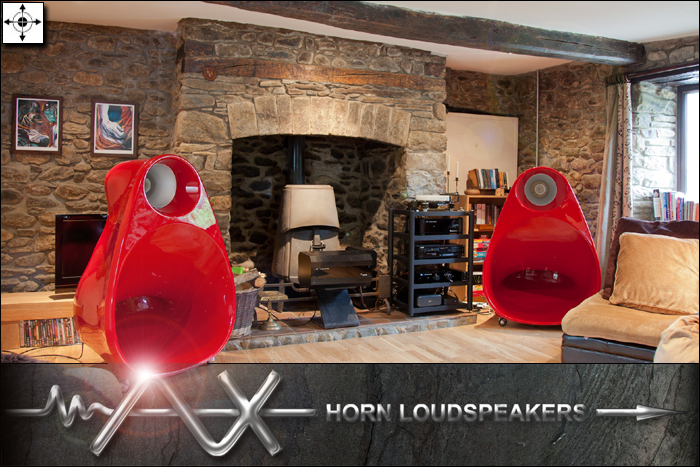 Fairytale or not, these intricate hornspeakers would fit in well with most decors. Just pick your colour. As mentioned before, the speakers showed up with a Deqx HDP4, NuForce DDA-100 and cables. Fred intends to ship a complete ready-to-use system after connecting the Deqx to a source. Said Deqx is a versatile machine and used here as high-pass filter + room correction. Fred presets the filter to cut off sharply at 50Hz and his room correction measurements were done outdoors to where the corrective curve resulting from the measurement is not a real room correction but more the speaker’s tuning to a linear anechoic response.